These delightful dichroic pendants are the latest rage in Murano. Made in Murano in the traditional lampwork styles used in making figurines and animals, our beadmaker uses boro glass instead of the Moretti glass as it allows him to work at a higher heat and the possibilities for Dichroic are much more. Each one handmade so the exact shape, size, coloration varies. Size is approximately 40mm top to bottom and 22 across with a self bail on the back. Borosilicate glass is a type of glass with the main glass forming constituents silica and boron oxide. Some borosilicate glasses have a low thermal expansion, making them resistant to thermal shock. Borosilicate glass was first developed by German glassmaker Otto Schott in the late 19th century. After Corning Glass Works introduced Pyrex in 1915, it became a synonym for borosilicate glass in the US. NASA developed dichroic glass for use in satellite mirrors. Multiple ultra-thin layers of different metal oxides (gold, silver, titanium, chromium, aluminium, zirconium, magnesium, silicon) are evaporated on to the surface of the glass in a vacuum chamber. Certain wavelengths of light will either pass through or be reflected, causing an array of colour to be visible. 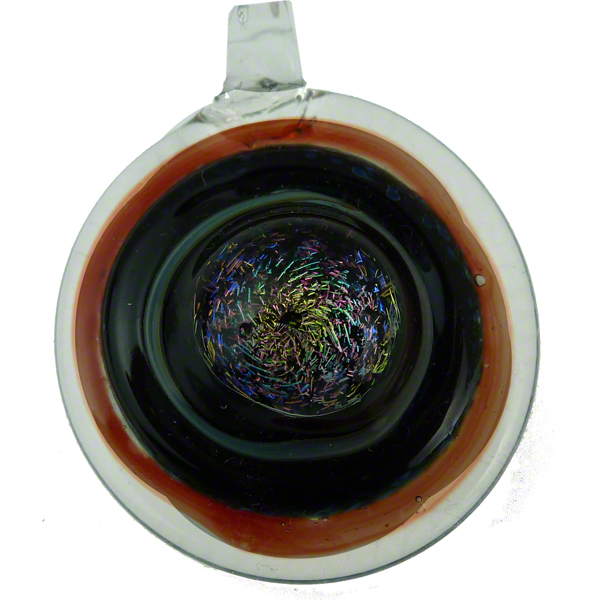 Due to variations in the firing process, individual results can never be exactly reproduced; each piece of fused dichroic glass is unique.